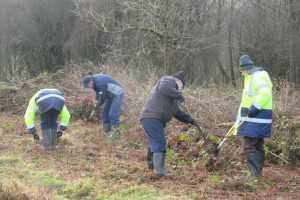 Volunteers are an integral part of the AONB team – much of the work of the AONB team could not be done without their support. Every fortnight on a Wednesday we are lucky enough to have a large team of extremely dedicated and hardworking volunteers undertaking practical tasks throughout the AONB – whatever the weather! They take part in a variety of tasks including vegetation management, dry stone walling, gate installation, coppicing and more. The team has grown, and we now have a regular group of up to 20 volunteers- it’s an extremely friendly and welcoming team and a real privilege to work with. The AONB is involved in the Nature and Wellbeing Project. 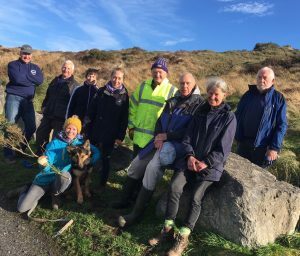 This project targets communities who are currently not accessing the Hills, but for whom access to the natural environment may be of great benefit to them. The reasons for the current lack of engagement for these groups may be mediated by social-economic status, ethnicity, age, disability and mental health. Some of our volunteers have been involved in supporting this projects work- working work with a wide range of people from different backgrounds and helping those who will benefit the most from the Hills to get out and enjoy them. This has included dry stone walling with participants from the HeadsUp Project in Wells, the creation of a wildlife garden for a care home, running a family open event for Naturally Healthy Month in May and visits to residents in Green Hill care home. 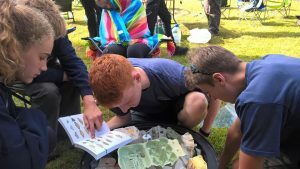 This year we have hosted work experience and college placements within the AONB team – providing the opportunity for young people to gain invaluable experience in the environmental sector and to get a taste for what it takes to work in this field. It has been a real privilege to work with such hardworking and enthusiastic youngsters this year and we look forward to developing this in the future. We have a dedicated team of Volunteer Rangers who act as ‘eyes and ears’ for us out on the Hills. They regularly patrol key visitor areas and report back issues such as fly tipping, damage to visitor infrastructure or misuse of the Hills. 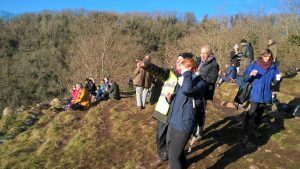 Our Volunteer Rangers also act as ambassadors for us taking part in public events, running information points, litter picking and running guided walks. This really is only a snapshot of what our volunteers get up to – so we would like to take this opportunity on International Volunteer Day to say a big thank you for all their hard work and dedication to the AONB.